I'm not sure what I was wearing but I remember clearly where I was: at home, in our detached garage office, arguing with my husband. About? Coffee. Or rather, personal preferences. Aharon had only been roasting for a few months - after his initial life-altering trip to the coffee farms of Boquete, Panama, where he first learned about coffee, harvesting and roasting - he returned to LA and our family with a fire in his heart and a pure desire to roast amazing coffees from around the world and share this coffee with everyone, everywhere. Every week following the Panama trip, Aharon left our family of 6 (4 kids, him & me) to fly up north, hone the craft of coffee roasting with his mentor Willem Boot, and then return that same night with eyes sparkling and plans to do something big: to roast coffee in a way that only a small percentage of the world's coffee roasters were doing. With consciousness. With intention, and meditations. With joy. I supported him whole-heartedly. I loved coffee! And while his business of design/build construction was steady and lucrative, I didn't share his passion for that industry and I could see that his unique and extraordinary culinary gifts would be handily applied in the coffee industry. After all, as he loved to remind me: coffee was a fruit! A red ripe cherry, grown in high elevation then picked and washed/dried with care. Why most roasters in the world then proceeded to take that precious fruit and burn and char it to a crisp (resulting in "dark roasted coffee") was totally beyond Aharon's understanding. When a coffee is OVER-roasted to the point of a dark/French/Italian roast, Aharon explained to me, the natural oils that escape from the coffee bean as it's roasted become burned and rancid. Needless to say, the resulting coffee was not the robust flavorful caffeine-rich and antioxidant-rich fruit that he had fallen in love with. I was onboard and moving forward, supporting him in our journey together into this exciting but very new (for us) specialty coffee industry. The very first time Aharon arrived home from Mill Valley, CA clutching a bag of the coffee he had selected as a green bean, then roasted in a manner he was happy with, he asked me if I would share a cup with him. Sure! Of course! Let's take it into the kitchen! You see, we were having this conversation in our detached garage where we had built a miniature coffee lab equipped with state-of-the-art coffee brewers, grinders, tampers, water filtration, everything. Everything that is, except what I needed in the kitchen. Cream. And sugar. Remember what I said earlier? We were arguing. This is why. Aharon argued that I needed to be open, to drink and sample the coffee he was roasting WITHOUT cream, without sugar, just black. And I - I am very strong-minded too, no accident we wound up together - I did not want to drink coffee without cream and sugar. In fact, I did not LIKE coffee without cream and sugar. Yuck! But it didn't take long for me to understand that this was too important to Aharon for me to insist on drinking his coffee how I liked my coffee. I capitulated. (Okay, maybe sulked a bit) but I put on a brave - nay, stoic face. For the sake of peace in the family, I would do this! Suffer through a few sips of black coffee. There are worse ways to end a fight. And friends, I do not lie when I tell you this: it was the cup of coffee that changed my life. Because that black, no-cream-or-sugar-added coffee was delicious. It didn't taste like dirt, or ashes, or bitter sourness, or any of the other ways black coffee had only ever tasted to me my entire life. Well-roasted, never over-roasted coffee is my playground and I have fun with it. Was there a moment or a particular coffee that you remember changing everything for you? If you want to have a transcendental black coffee experience, I recommend starting with our AM coffee or email us for a recommendation. Let's all experience joyful cups of coffee together. 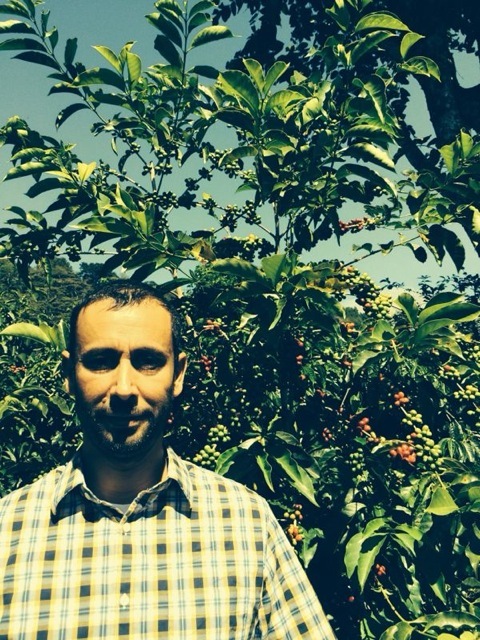 Aharon Vaknin in a coffee farm in Boquete, Panama. The man behind the beard!